The Interface A / EDA standards define powerful methods for collecting data from an equipment control application. The data collection can be as simple as querying values of a parameter or two, or as complex as gathering thousands of parameter values across multiple reports. EDA specifies the use of internet standard messaging protocols like HTTP, XML and SOAP messages for collecting this data. It is possible to define so many data collection plans gathering so much data that the sheer amount of data causes network performance to degrade. To remedy this situation, the EDA standards provide ways of sending the data in “chunks,” which dramatically improves the performance of XML over HTTP. Two methods for sending data in chunks are grouping and buffering. 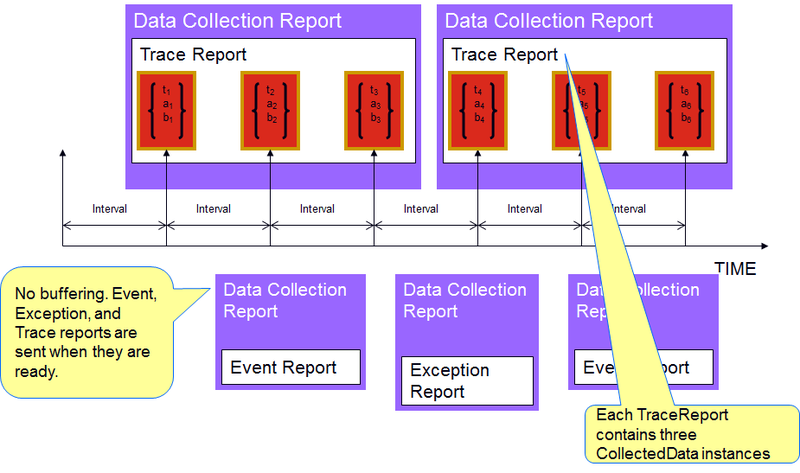 Grouping only applies to individual Trace Requests within a Data Collection Plan (DCP). If I have a trace request with an interval of one second, a group size of 1 would generate a report every second and send it across the wire. If I change my group size to 10, a report would still be generated every second, but the report would not be sent across the wire until 10 reports have accumulated. Each report has its own timestamp and they are arranged in the order they occur. The following diagram shows a trace data collection report with a group size of 3. 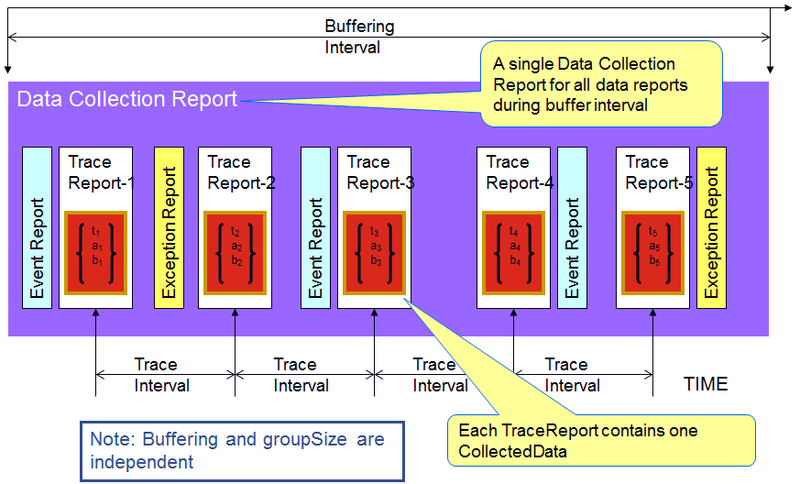 Buffering is different from grouping in that the buffer interval (in minutes) applies to an entire DCP rather than individual trace requests within that plan. For example, if I have a DCP with three trace requests and two event requests defined with a buffer interval of 1 (meaning one minute), the trace reports would still be generated at the specified trace interval. Event reports would be generated as the events are triggered. The reports are not sent to the EDA client until the buffer interval expires. At that point, all the data reports that were generated within that buffer interval time are packaged and sent to the EDA client. Grouping and buffering can be combined as well. Groups are still defined on a per trace basis. If a group size has not been met when the buffer interval expires, the group report will be in the next buffer report that is sent. With the provision for transmitting data in blocks, using grouping for trace data reports and/or buffering for all data reports, EDA is well suited for collecting large amounts of data without having a negative effect on network performance. EDA Testing – How is this accomplished today?? Over the past several months, we have posted a number of blogs dealing with the testing of SEMI’s Equipment Data Acquisition (EDA / aka Interface A) standards suite. The first of these posts connected the importance of this topic to the increased adoption of the EDA standards across the industry, and broke the overall problem domain into its three major components. Compliance testing – does the equipment adhere to the specifications described in the SEMI Standards? Performance and stability testing– does the equipment meet the end users’ performance and availability specifications? Equipment metadata model conformance testing – does the equipment model delivered with the interface represent the tool structure and content anticipated by the end customer? To bring this series to a close, this post addresses the “as-is” state of EDA testing as it is practiced today by the advanced semiconductor manufacturers who are requiring EDA interfaces on new equipment purchases and the suppliers who provide that equipment. ECCE Plus product- this software tool was originally developed under contract with the International Sematech Manufacturing Initiative (ISMI) to validate the fidelity, usability, and interoperability of early versions of the standard; it can used to manually execute a set of procedures documented in the “ISMI Equipment Data Acquisition (EDA) Evaluation Method for the July 2010 Standards Freeze Level: Version 1.0” document (see title page below) to exercise most of the capabilities called for in the standard; note that this is the only commercially available solution among the three. Company-specific test suites – one major chip manufacturer (and early adopter of EDA) maintains its own partially-automated set of compliance tests, and provides this system to its equipment suppliers as a pre-shipment test vehicle. This set of tests is then used in the fab as part of the tool acceptance process; however, this system also includes a number of company-specific automation scenarios, which are not available for outside use. This highlights the need to support custom extensions in an industry-validated tester if it is to be commercially viable. In-house custom test clients – this is a variation of #2 that some of the major OEMs have chosen as their economies of scale dictate; the problems with this approach are that a) the test clients must be kept current with the EDA standards, which are themselves a moving target, and b) unless thoroughly validated by the eventual customers of the equipment, there is no guarantee that passing these tests will satisfy the final acceptance criteria for a given factory. For performance and stability testing, there are no automated solutions currently available. The ISMI EDA Evaluation Method does describe some rudimentary performance evaluation procedures, but these no longer reflect the expectations of the customers with many years of accumulated EDA production experience. Clearly a better solution is needed. Finally, for metadata model conformance testing, the only available solution is the Metadata Conformance Analyzer (MCA) that was commissioned by Sematech and implemented by NIST (National Institute of Standards and Technology). 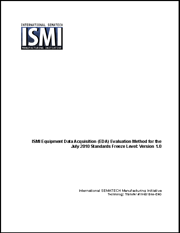 It has not been updated in almost five years, and exhibits a number of known issues when applied to a SEMI E164-compliant equipment model (E164 = Specification for EDA Common Metadata), so it will be increasingly insufficient as more companies require full Freeze II / E164 specification compliance. The good news in all this is that Cimetrix has recognized and anticipated this emerging need, and is actively addressing it on our product roadmap. If you want to know more about EDA testing and/or discuss your specific needs, please contact Cimetrix for a demonstration of this exciting new capability! 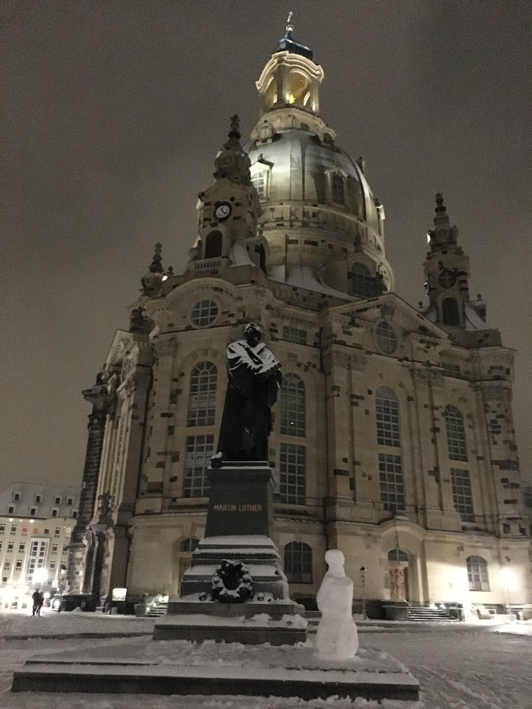 The focus of the most recent SYSTEMA Expert Day, held during a snowy week in Dresden in late January 2016 in conjunction with the 13th annual innovationsforum, was “200mm Fab Enhancement” and featured a number of presentations from Systema GmbH customers and partner companies. By way of background, there are a number of reasons for the emphasis on 200mm fab enhancement, most notably that many of these factories are enjoying a renaissance of business to meet the growing demands for IoT (Internet of Things) devices. Moreover, since the drivers for this market segment include cost, variety, and volume, the automation and operations people in these factories are faced with a new combination of challenges not seen in earlier markets. Cimetrix’ contribution to the event was a presentation titled “Equipment Data-Driven Continuous Improvement for 200mm Fabs,” which outlined a model-based, ROI-driven approach for adding equipment data collection capabilities to existing factories. Our basic premise is that such an approach helps meet some of the automation challenges in an incremental, cost-effective way without requiring major redesign of the factory or equipment control systems. 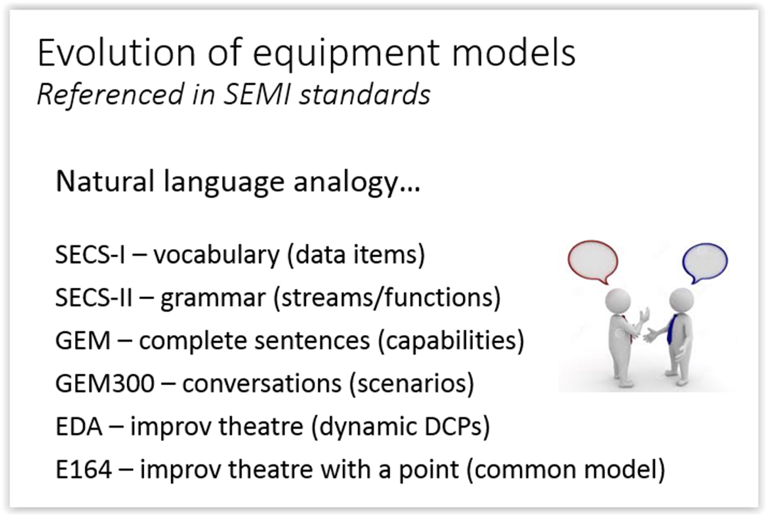 Since the term “model” is used in many different contexts, we first clarified what this term means in the context of SEMI equipment communications standards, and how this evolved over the past three decades. This was accomplished using a natural language analogy, which is shown in the figure below. Note that the culmination of this process to date is the EDA (Equipment Data Acquisition) metadata model called for in the latest generation of standards, which is very prescriptive in terms of structure, content, and naming conventions for the elements of a semiconductor manufacturing equipment. And even thought the specifics of this model were designed with 300mm wafer fab equipment in mind, the principles well apply to all substrate sizes, and even to the types of material, processes, and equipment found in back end assembly and test factories. 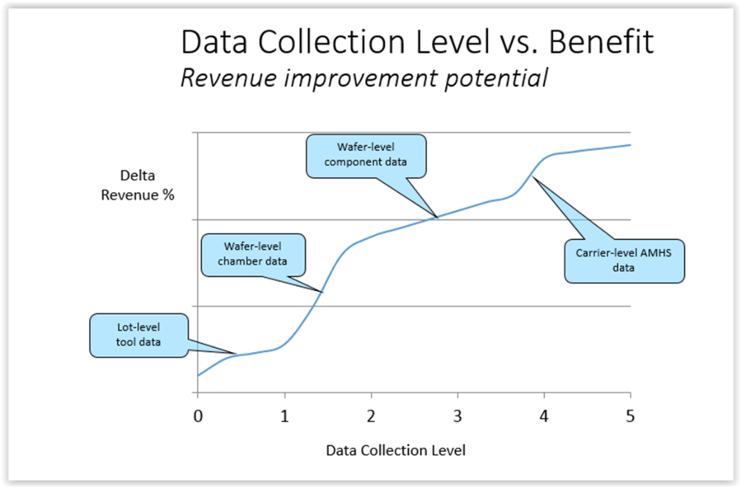 After establishing the value of explicit models for representing equipment, sensors, and other key items in a manufacturing environment, we next introduced concept of an ROI-driven strategy for evaluating the relative benefit of various data collection projects. 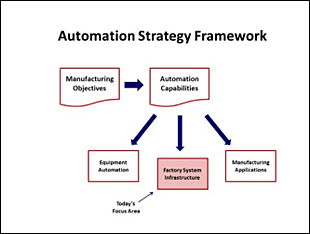 This strategy first identifies and ranks the key manufacturing objectives that must be addressed, then poses the questions that must be answered to meet those objectives. It then identifies the data sources for the information required to answer those questions, and the data collection techniques (including software) applicable to those sources. Finally, since the original objectives can change with time and additional knowledge, they should be re-examined periodically, giving the strategy an iterative aspect as well. In order provide specific examples for the uses of equipment data in a continuous improvement program, the presentation listed a number of application use cases that have been successfully deployed in 200mm facilities. These included (in general increasing order of complexity) substrate tracking, process execution tracking, product time measurement (aka wait time waste analysis), external sensor integration, component fingerprinting, and product traceability. A couple of these were then explained in more detail, showing how a basic tracking application could start by using a small subset of the equipment data, and then evolve over time to provide more advanced functions (and benefit!) as more detailed information was made available. “Equipment Data-Driven Continuous Improvement for 200mm Fabs"
December 16-18 in Tokyo, SEMI played host to SEMICON Japan that was co-located with the WORLD OF IOT, a special “show-within-a-show” dedicated to the Internet of Things usages that are propelling the next generation of microelectronic advances. SEMICON Japan is of note as Japan has the world’s largest installed fab capacity with more than 4.1 million 200mm equivalent wafers per month representing a high product mix. Over 60,000 visitors attended the three-day event who met with nearly 800 exhibitors; attended forums, technical sessions, and networking events; and had the opportunity to see new innovations and technologies within the industry. One highlight of the show was the Sustainable Manufacturing Pavilion. The pavilion focused on 200mm fab capacity where increased demand from IoT devices is anticipated. Revamping of the existing capacity and building cost-conscious capacity will be key to the sustainable growth of the industry. Sustainability in microelectronics manufacturing is quickly moving from a minor area of focus to a major consideration in business planning. Forward-thinking device makers, materials suppliers, and equipment manufacturers are all beginning to understand sustainable manufacturing makes economic sense for the future. The pavilion offered many related sessions throughout SEMICON including the SEMI Technology Symposium Test Technologies for Automotive Semiconductors; the SEMI Technology Symposium on DFM in the Trends towards Fabless/Foundry Manufacturing and Alliances; the SEMI Technology Symposium on The Dreams and Reality of TSV/2.5D/3D Packaging; and a Sustainable Manufacturing and High Tech Facility Forum. 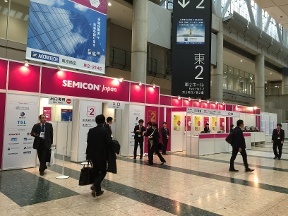 This year’s SEMICON Japan also featured a Manufacturing Innovation Pavilion that showcased inventive processes, equipment, manufacturing, components, and materials technologies that enable smarter and faster—yet cheaper—semiconductor devices to create our advancing society, industry, and life. The pavilion demonstrated that developing microelectronics technologies that will make the IoT possible requires continued innovation in semiconductor manufacturing equipment, materials, and components. 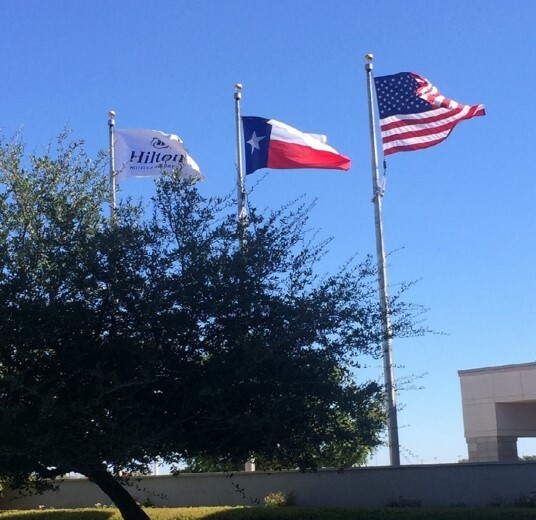 In conjunction with the Manufacturing Innovation Pavilion, SEMICON conducted a Semiconductor Executive Forum, a Lithography Business Forum, and a Manufacturing Innovation Forum to exchange ideas and share knowledge about the topics featured in the pavilion. The WORLD OF IOT brought together leading global electronics and microelectronics companies whose innovations are driving the expansion of mobile technologies, cloud computing, and network-connected devices. 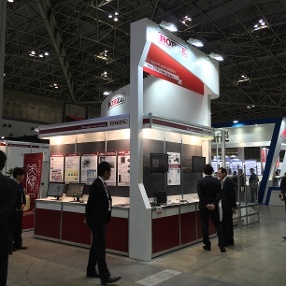 Held in conjunction with SEMICON Japan, WORLD OF IOT was a "show-within-a-show". Exhibitors included such noteworthy companies as Tesla Motors, Toyota Motor Corporation, and Intel KK that demonstrated current projects and developing technologies. Executive forums and technical sessions were also offered everyday during the show. 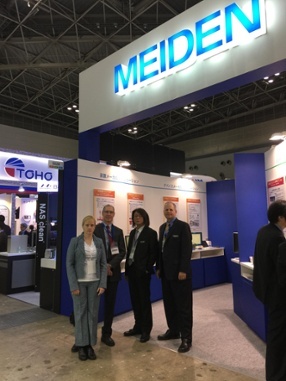 Cimetrix was proud to be represented by our two distributors in Japan, Meidensha Corporation and Rorze Corporation, who both featured our SECS/GEM and EDA product lines. For Rorze, 2015 has been a significant year, the company celebrated its 30th anniversary. Stay tuned for my upcoming blog about its amazing anniversary celebration. In my October 27th blog, I wrote about the Equipment Automation topic shown in the figure below and stressed the importance of developing good equipment purchasing specifications from the outset to ensure the company’s manufacturing objectives can be met. Given the number of EDA pilot and production projects currently active across the industry, it’s likewise important to consider what kind of Factory System Infrastructure will be necessary to support a full-scale EDA deployment… so the purpose of this posting is to highlight this topic for the semiconductor manufacturing IT professionals who may face these challenges soon. However, before diving into a detailed design process for an EDA factory system, you must decide what overall system architecture will govern that design. A number of factors go into this decision, including 1) the functional requirements that distinguish EDA-based data collection from other more traditional approaches, 2) technology constraints of the existing factory systems, 3) budget limitations, 4) schedule requirements, and especially 5) the non-functional requirements (scalability, performance, reliability, ease-of-use, etc.) that often make the difference between success and failure of a given system. Each of these factors deserves a thorough treatment of its own, but since we were invited to address this topic at a recent seminar sponsored by SEMI Taiwan, we’ve assembled an overview presentation entitled “Factory Systems Architectures for EDA” that you can use as a starting point. It not only covers in more depth the requirements above which drive key architectural decisions, but also suggests what some of the major architectural components of a production system would need to be, based on the experience Cimetrix has gained working with the earliest adopters of EDA across the semiconductor device maker and equipment supplier communities. These include provisions for handling the scores of equipment metadata models that will exist in a production facility, for creating and managing the thousands of data collection plans that are resident at the equipment instances themselves, for monitoring and maintaining the overall performance of a system with such inherent flexibility, and for a number of other examples. Finally, the presentation describes some high-level examples of architectural “styles” that have been implemented in the industry thus far. 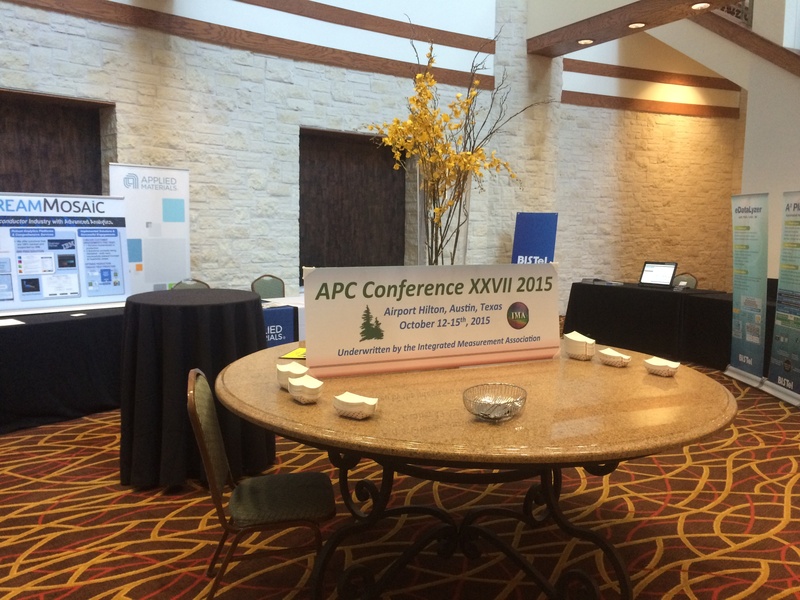 Cimetrix participated in the recent Advanced Process Control (APC) Conference in Austin, Texas, along with more than 120 control professionals across the semiconductor manufacturing industry. This conference, now in its 27th year, is one of only a few global events dedicated to the domain of semiconductor process control and directly supporting technologies, so it was encouraging to see its attendance and energy level rebound from its low water mark a few years ago. The calendar may have indicated it was fall, but nobody told the weather forecasters… Austin set temperature records that week, even hitting 99°F one day! 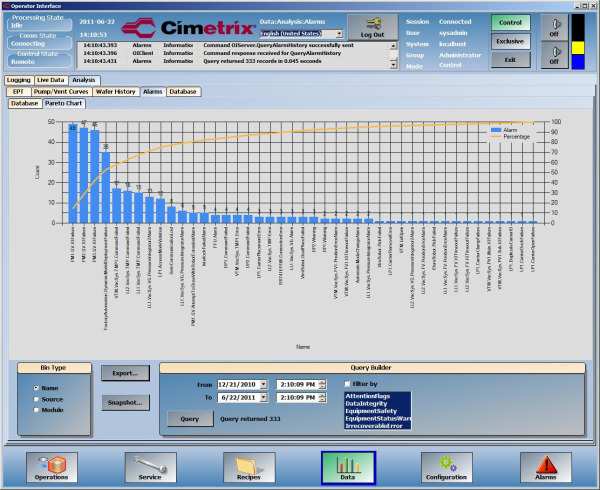 Given the importance of high quality equipment data for all types of equipment- and factory-level process control applications, it is vital that Cimetrix and its customers understand the current requirements and future direction of this industry segment. Many presentations addressed these topics indirectly, but perhaps the newest insights in this regard came not from the wafer fabrication processes, but rather from the Back End, OSAT (Outsourced Assembly and Test), and advanced packaging segments. The takeaway for Cimetrix in all this is that the back end equipment suppliers will need to anticipate this demand and may need to upgrade their interface capabilities substantially. Since some of Cimetrix’ customers have pioneered the application of the latest generation of SEMI EDA (Equipment Data Acquisition) / Interface A standards in plumbing data from external “add-on” sensors to fault detection applications, I presented a generalization of this approach during one of technical sessions. 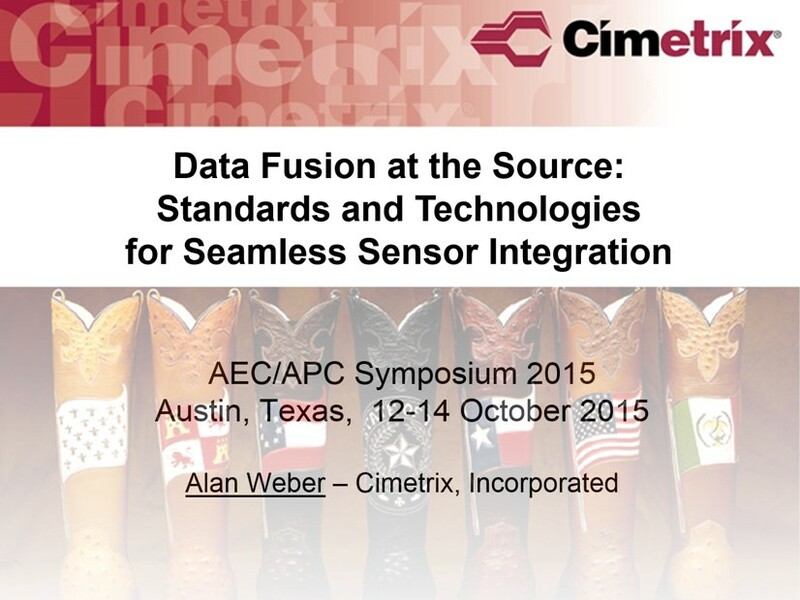 This presentation, “Data Fusion at the Source: Standards and Technologies for Seamless Sensor Integration” is available on the Cimetrix website for those who want to learn more about how this is done. Check back next week to learn more about creating good EDA/Interface A purchasing specifications. The creation of a new software product is an exciting process. Often, as was the case with the Cimetrix CIMControlFramework™ (CCF) software, this process begins with a partner that will become the first customer of the product. Cimetrix teamed with Axcelis Technologies to develop a new tool control framework for one of their process tools. A following project with Rorze Automation further developed the framework and produced CCF 2.0. Upon completion of that project, Cimetrix continued the development of the tool control framework to become a standard product that any OEM could use, resulting in the release of CCF 3.0. We simplified the data configuration so that parameters, events, and alarms are registered at start up and automatically coordinated with the configuration files for the factory automation products. In the previous versions, CCF was configured to work with a CIM300 or CIMConnect product that was previously installed and configured for the equipment. The problem was that if someone needed to change the connectivity functionality, that change was not reflected in the tool control portion of CCF, or vice versa. This meant that the required changes had to be implemented twice, resulting in duplication of effort. Since we wanted to develop the product for a broad range of customers, we wanted to make sure that during tool initialization, OEMs would be able set up alarms, variable definitions, collection events, etc. one time for both tool control by CIMControlFramework and for the connectivity products. With the tighter integration in CCF 3.0 to coordinate the tool control and the connectivity, initial deployment is now much easier and faster. Below is an example that shows how alarms, events, and variables are tied together. 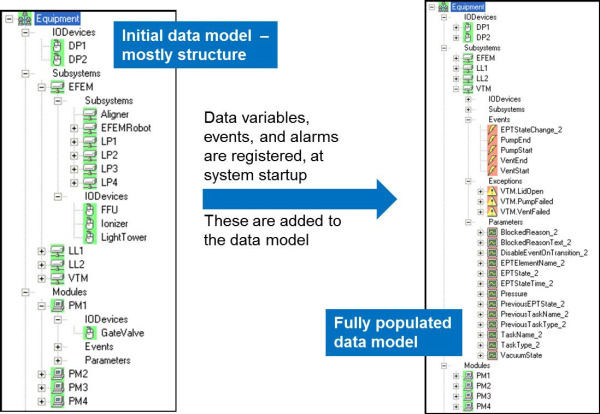 OEMs create the initial model using EM Developer, and then all of the configured alarms, events, variables are dynamically added to the model after startup. You don’t have to create all the details of the model, just the basic configuration and CCF fills in the data. We learned from the initial deployments that tool operators need quick access to process data in order to improve productivity and lower costs. For CCF 3.0, Cimetrix implemented dedicated history tables to improve performance of queries on historical data. The new history tables allow for much faster queries for wafer, EPT and Alarm history information. All logged information is written to log files. Any log information related to wafer, EPT, or alarm history is also written to the respective table in the on-tool database. The benefit is fast and easy visualization of the equipment process data that is 20-30 times faster than the previous CIMControlFramework product. The following graph shows the frequency of alarms reported by the equipment, which can be used to identify problem areas. This type of data now comes back within a few seconds. The new installer allows the user to select the specific CCF modules needed and any other embedded Cimetrix products – such as CIMPortal™ or CIM300™ they want to install and configure. The installation is done in 2 phases. The first phase installs all files related to the products selected, including the source code. The second phase installs and pre-configures CCF and any pre-requisite packages. With the installation package, the time to time to install is dramatically reduced. To help a project team get started faster and get them more productive sooner, the Cimetrix created new labs that offer hands-on exercises. One example is a lab to show the process for customizing user screens. Both the problem case and the completed solution for each lab ship with CCF. The real benefit is customers can use the labs as a starting point for their project or as reference material to help them create their own implementation. Below is a screen shot from a lab that walks students through the process of creating a custom screen to visualize data for their specific tool, such as visualizing pressures, load locks, robots, load ports, processing chambers, etc. Cimetrix is a software company dedicated to continual product enhancement. This release delivers improved functionality and performance that will benefit our customers. With CIMControlFramework, OEMs have a great solution for tool control that allows them to spend more time and effort on delivering their unique value to the market, and far less time on tool control and connectivity—and it just keeps getting better. This is another example of what Cimetrix does to support our customers to speed them through the development phase and into production. 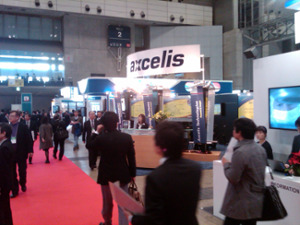 We had a strong showing at SEMICON Japan at the Makuhari Messe December 1 - 3. Attendance was brisk, and Cimetrix products were on display at both the Meiden and the Rorze booths. This event was a great opportunity for us, since we have just started Cimetrix Japan K.K. effective November 25, 2010. The new Cimetrix company will provide both new market development and customer support for the Japan marketplace. 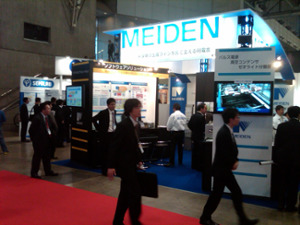 In the Meiden booth, Cimetrix EDA/Interface A products were on display. In addition, Meiden highlighted the partnership between Meiden, DSD, and Cimetrix, which allows DSD and Meiden to offer complete EDA solutions using Cimetrix technology. These solutions are available to both equipment suppliers and IC manufacturers, and Meiden listed the benefits and sample architectures for each group. 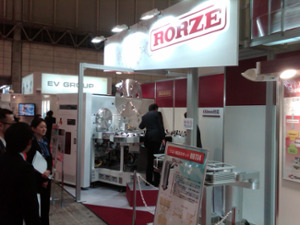 Cimetrix CIMControlFramework (CCF) was on display at the Rorze booth running a complete 450mm vacuum platform. Many visitors stopped to watch this powerful demonstration. Cimetrix products were also highlighted, along with Rorze’s unique ability to deliver a complete hardware/software platform solution for equipment suppliers using Rorze and Cimetrix technology. One other highlight of the show was visiting the Axcelis booth where they highlighted their Integra plasma dry strip cleaning system that uses the Cimetrix CIMControlFramework. We also learned at the show that a new top 20 OEM in Japan would adopt Cimetrix connectivity products. It is great to see how companies are using our solutions to get to their products up and running in wafer fabs around the world. Thanks to all those people who stopped by the booths. Please let us know if you need more information about Cimetrix connectivity or tool control solutions. Engineers love data. Business people love information. But it all starts with high-quality, real-time data. 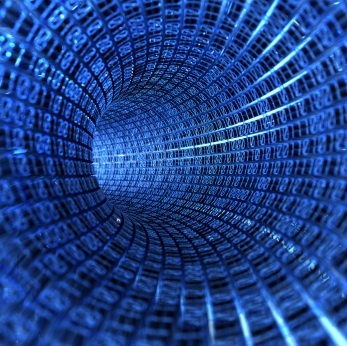 The possibilities are endless with good data. As an equipment supplier, history probably has you living with a tool architecture from the early 300mm days. The focus was on implementing AMHS systems and meeting the GEM300 standards. A data driven architecture wasn't on the radar screen. And it wasn't a business priority. Times have changed. Fabs started asking for more data by creating the SEMI Interface A standards - and equipment suppliers are learning they can produce more productive equipment by leveraging the right data. Interface A was an interesting concept when it started in the early 2000s. Discoverable data available to the fabs in real time would seem to be the answer to many problems. But the adoption has been less than stellar - even with strong endorsement and technical support by ISMI. Lack of fab side applications plumbed to use the Interface A data and "ownership" issues of the data haven't helped. These are real business problems that must be solved and will be solved with the next wave of fab purchases. But what have we learned as equipment suppliers and software providers? Tool data models are helpful. Self description is great. We can create high performance data gathering applications that integrate with existing tool control architectures to make data available and controllable by the equipment supplier. Look at the performance of CIMPortal, our comprehensive equipment data acquisition (EDA) solution. We also learned that given the opportunity to "start over", we can create new tool control architectures that are data driven and prepared for the future. Look at CIMControlFramework. So the data is available - or you can make it available with an existing or new tool control architecture. Let's put this data to work. Either to benefit you as the tool supplier or to help your customer. How is your tool accepted at the fabs? Do you have contingencies on your customer's payments? Does tool uptime have an impact on the tool price? Are your warranty costs too high? You get the point. With high-quality, real-time data at our fingertips, we can solve some of these business issues. We are at the beginning of a phase where the tool supplier makes use of this data and it directly impacts business results. Tool side fault detection, preventative maintenance, whatever is needed. The important point is we are finally starting from a strong foundation with the right data at the right time - and it can lead to increased margins or higher levels of customer satisfaction. Bring us your business problem and let's build something together to put this data to good use. Let's do it now! It is a natural tendency to think that Yield Ma nagement Integration is simply a data integration job that gathers related manufacturing and test data into a Yield Management System (such as dataPOWER, PDF), and thereafter the engineers and their Yield Management System live happy ever after. For the fact that a production environment is never static and is evolving constantly makes the maintenance aspects of the Yield Management System a formidable challenge. 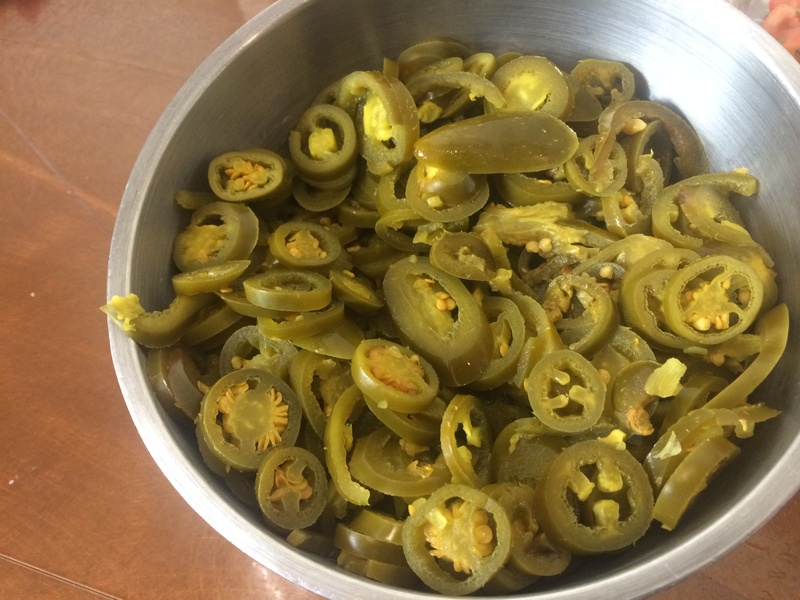 It is fairly common to see a facility struggling to have its newly implemented Yield Management System keep up with new production needs. Any intentional or unintentional change in manufacturing data may break the loading of a data feed causing its yield analysis capabilities render useless. The following are some of the key considerations when designing or selecting a solution for the implementation of a Yield Management System. How flexible is the solution in adapting to changing needs in the manufacturing environment? For instance, a new foundry plant is providing the assembly testing that feeds an existing data source for the Yield Management System. However, its test data does not comply with the expected format and could not be processed and loaded. 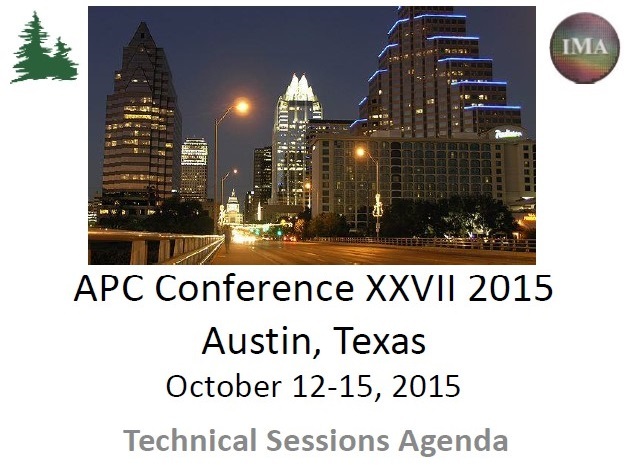 What will be the cost and effort associated with fixing the assembly test data feed? Did the test data for the lot make it to the Yield Management system? Perhaps the lot has not even been tested or data was not made available to the system. How the error could be eradicated and the data loading be resumed. What tools are provided to facilitate such activities? Does the system provide critical alarms and warnings ahead of time such that problems are not identified only when data are discovered to be missing or incorrect during yield analysis? These alarms and warning could also include system resources such as storage space and CPU usage that could affect the processing and loading of yield related data. In considering a solution for Yield Management System integration, perhaps more than simply concerning about getting the data accurately into the system, the ease of system maintenance is equally important.